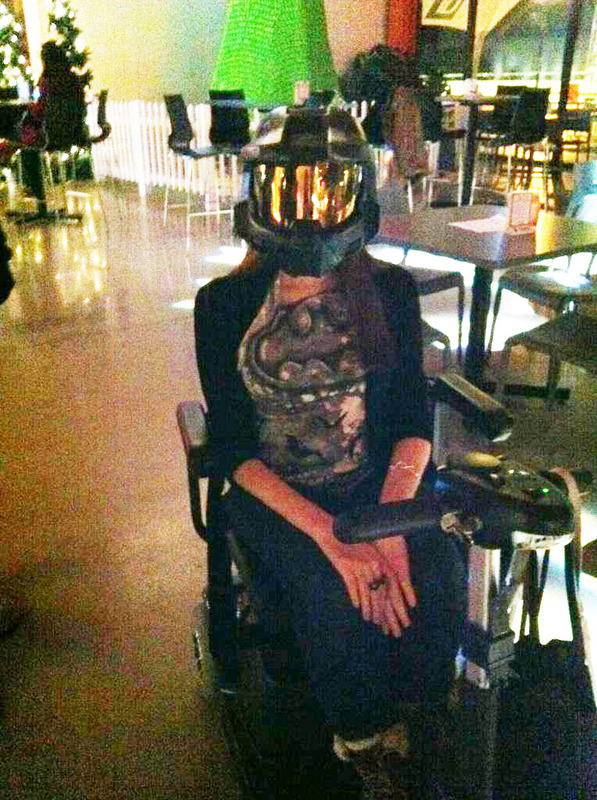 Remember the guy who bought Halo armor with the money from his un-used engagement ring? Now, now. Don’t freak out. I’m not “the girl.” The story hit the web a few weeks ago. Writer Eric Smith detailed a heartbreaking yet uplifting story about a serious breakup. On the Bygone Bureau he wrote “Master Grief,” the tale of how he sold the engagement ring meant for his girlfriend and bought a full body suit of Master Chief armor from the video game Halo. I feel like there is this misconception about people that are passionate about costumes, whether they are dressed as someone from a videogame, comic book, or anime, and I never quite understood it until I walked my first convention floor. Outsiders think costumers immerse themselves in another character to get away from who they really are — that they are geeks that could never quite cut it, and need to ditch reality for a few hours. They’re wrong though. Within that shell, whether it’s made of cardboard, plastic, fabric, fiberglass, or steel, hidden away there is a figure worthy of attention. It’s the person who put all their heart and soul into a project, and now they’re wearing their work all over them. Like I said, I know Eric so why didn’t I mention this before? Well, I actually had no idea the guy in the story was Eric until last night. That’s when we both appeared on “Pretending to be on Television with Glen Tickle.” (You can read an interview The Express Times did with me about it here.) It was fun times but Eric was on stage first and walked up with a Master Chief helmet. “That’s odd,” I thought to myself, but not so odd for the company we were in really. Then the host (also a friend of mine) got to talking with Eric and the story came out. I went to college with both Eric and Glen. Eric actually used to date a friend of mine. (Who he later told me people assumed was the ex-girl in question. She wasn’t.) But it wasn’t until earlier this year that we managed to connect again through Quirk Books. They’re the ones who brought us Pride and Prejudice and Zombies among fun titles. Eric does marketing and social media for them and threw some books my way he thought I might be interested in reviewing (like the DC Poster Book). I even chatted with him at the Quirk booth at New York Comic Con a few months ago completely clueless to the fact that he had this major costume. I have to say, I was very impressed. I knew Eric was a cool guy but he went up about 50 points after hearing he was the one attached to this story. He does more than just walk around in uncomfortable armor though. Eric founded Geekadelphia and actually just published his first book, Textually Speaking. Give them both a look in addition to his personal site and his twitter. The Master Grief link is broken. 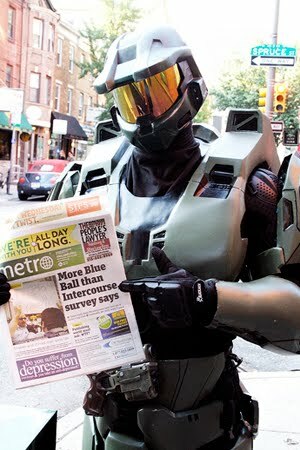 Wow, that's a badass costume, and I've never even played Halo (I'm a PS3 guy). Personally, though, I think this is further evidence that engagement rings are a ridiculous waste of money. A hearty thanks to deBeers, Zales, Jared, et al, for forcing this commercial nonsense into our culture. Yay Eric and Jill! You two are really living the geek dream! Love you both and keep being extraordinary. We loved having you. The clip will be up soon.